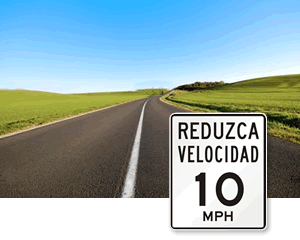 Make sure your signs aren't limited to English with Spanish Speed Limit Signs. No matter how you say it, speed limits save lives! A Spanish Speed Limit Sign will remind drivers to slow down and proceed safely. • Spanish signs ensure you reach a larger audience, which means fewer accidents. • Choose from Slow Down signs and Maximum Speed signs. • Signs last for up to ten years (or more!) outside. • Scroll over signs for more details. Questions? Call our live support now. Ideal for neighborhoods with a large Hispanic populace. Varied sizes and materials available.